Because of increasing expense to put on the annual July 4 fireworks show at Siesta Public Beach, this year’s pyrotechnical display could be the last one. 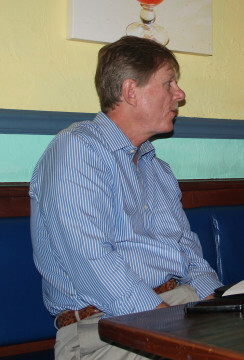 That was the news Mark Smith, the Siesta Key Chamber of Commerce chairman, reported to the Siesta Key Association (SKA) on April 7. Already, the Siesta Key Village Association (SKVA), the Chamber and Visit Sarasota County have contributed $5,000 each toward the event, he added. The Chamber also is seeking donations from anyone — individuals and families — who would like to contribute funds, Smith said. A banner will be put up to show the name of every person and entity that donates money for the show, he pointed out. In the past, Smith explained, the Chamber relied heavily on the sale of tickets to its VIP party on July 4 — which cost $150 per couple — to cover the expense of the fireworks. Numerous restaurants that are Chamber members always have donated the food for that gathering, he added. The tickets came with designated parking close to the beach. However, as the county’s $21.5-million project was underway last summer to improve the amenities at Siesta Public Beach, the Chamber had to shoulder a much higher expense to protect those upgrades as it held the VIP party, Smith explained. “We want this to be a community effort,” Smith said. “It is a community effort. SKA First Vice President Bob Stein pointed out that it would cost about $17,000 more if the Chamber decides to hold the VIP party again this year, given expenses for renting tents and tables, for example, as well as matting to protect the grass. In the past, Stein noted, participants dined at the picnic tables that stood year-round in the park, but all of those tables were removed as construction crews created new amenities. 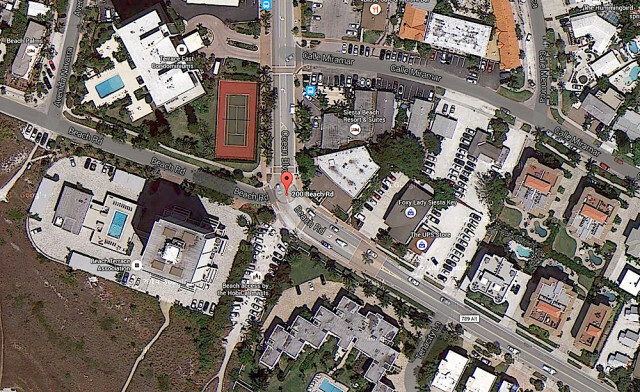 Furthermore, Stein said, people who were not VIP partygoers complained about the priority parking the guests enjoyed. SKA President Michael Shay told Smith that the board would meet prior to the end of this month, at which time it would consider the request for the $5,000. 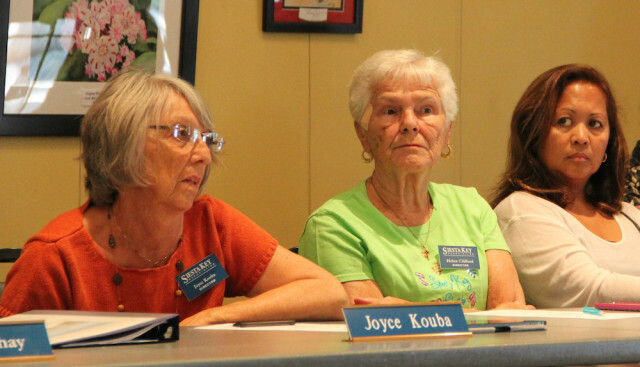 It ended up taking only one more day to resolve concerns over whether the Siesta Key Village Association (SKVA) could continue to use Beach Access 5 for its annual Easter Egg Hunt and Children’s Party. SKVA Treasurer Roz Hyman told The Sarasota News Leader this week that she met with George Tatge, manager of beaches and water access in the county’s Parks, Recreation and Natural Resources Department, on Wednesday, April 6. Hyman added that she was pleased to see such a fast resolution to the issue, which she brought up during the SKVA’s monthly meeting on April 5. Questions had been raised about SKVA members blocking off parking at Access 5 to allow room for families and children to see Sheriff’s Office Mounted Patrol members, for example, and — this year — learn about beach-nesting birds from Sarasota Audubon representatives. During both the SKA and SKVA monthly meetings last week, SKA President Michael Shay announced that about 35 volunteers had signed up already to help collect litter on the Key during the Great American Cleanup on April 16. 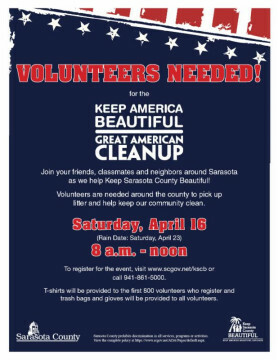 The local event — part of a national effort — is sponsored by Keep Sarasota County Beautiful. Among the areas of focus will be Siesta Public Beach, Ocean Boulevard, Higel Avenue and the Point of Rocks area, Shay added. The volunteers will meet at 8 a.m. April 16 at the pavilion at the public beach. Anyone wishing to help out has to register with Sarasota County, he pointed out. To do so, a person may visit https://sarasotacountygovernment.formstack.com/forms/kscb_gac or call 861-5000. A poster says the first 800 volunteers to register will receive T-shirts. Trash bags and gloves will be provided to all participants, the poster notes. SKVA President Wendall Jacobsen, general manager of the Beach Bazaar in Siesta Village, told Shay he would like to donate sunscreen for the volunteers. 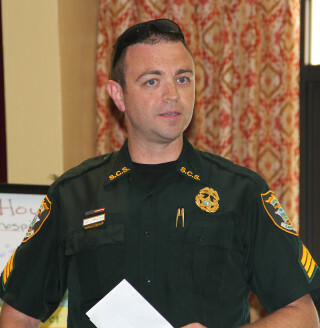 During the April 7 Siesta Key Association meeting, Sgt. Jason Mruczek of the Sarasota County Sheriff’s Office fielded a complaint about what a Siesta Isles resident described as “a pretty boisterous” group of people on the public beach about 10 p.m. the previous day. When Mruczek asked if she could provide him any more details, she added that the noise indicated “a lot of horsing around,” especially for that hour. SKA President Michael Shay elicited laughter when he asked if she was referring, perhaps, to the Sheriff’s Office’s Mounted Patrol. No, it was not that type of horsing around, she responded. Mruczek explained that a number of high schools and colleges were on spring break that week, but did not recall having received any information about noise complaints related to beach activities late on April 6 or early on April 7. Then Lt. Debra Kaspar told the SKA members what she mentioned during the Siesta Key Village Association meeting earlier in the week: Hundreds of young people had been gathering on the beach until 2 a.m. some days, but Mounted Patrol officers and deputies on ATVS had been working to disperse them. “We try to get in there and keep it all under control,” she added. On a related note: Mruczek said deputies wrote 476 parking tickets on the Key during the month of March. The offending vehicles were parked up and down the island, from Turtle Beach north, he noted. Finally, Mruczek reported that the parking spaces at Siesta Public Beach have been filling up fast, which made him all the happier that Sarasota County increased the number of slots as part of the improvements at the park. The total number of spaces is 980, county staff has told the News Leader. In January — before he joined the SKA board in February — Harold Ashby told members of the organization that bicycle safety is his passion. 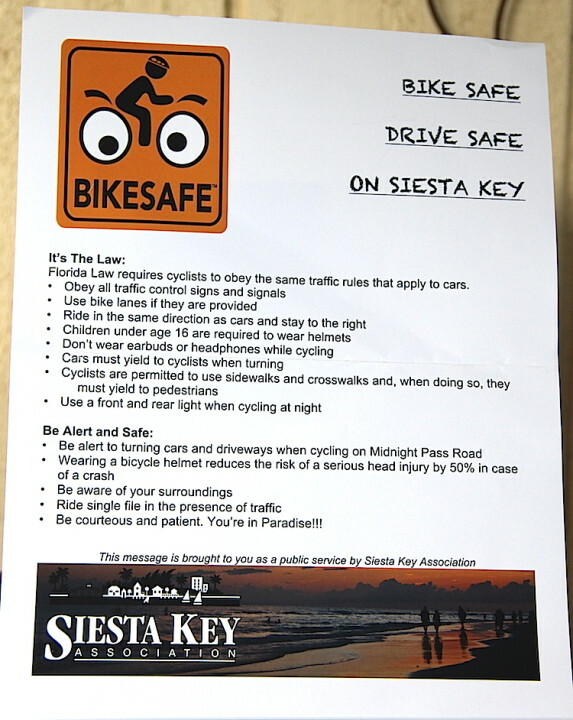 The flyer represents the message the SKA has developed as part of its Bicycle Safety Awareness Initiative, Ashby added. Copies have been distributed to the condominium complexes on the key, he continued, with the hope that managers and other employees will post them on bulletin boards and distribute them to residents and guests. 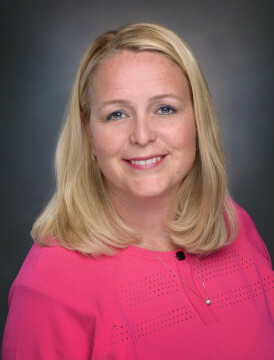 After the News Leader published an article last week about Sarasota County hiring Nicole Rissler as the new deputy director of operations for the Parks, Recreation and Natural Resources Department, an SKA member asked whether Rissler essentially would be taking George Tatge’s place. As reported last month, Tatge will be retiring on May 31 after more than 35 years as a county employee. Siesta Chamber Executive Director Ann Frescura reported to SKVA members on April 5 that the organization’s new membership director, Suzanne Roberge, is “doing a great job … She’s been out and about,” meeting people and making deliveries.